"The most likely explanation is that this core rotation is left over from the period when the sun formed, some 4.6 billion years ago," said Roger Ulrich, a UCLA professor emeritus of astronomy, who has studied the sun's interior for more than 40 years and co-author of the study that was published today in the journal Astronomy and Astrophysics. "It's a surprise, and exciting to think we might have uncovered a relic of what the sun was like when it first formed." The researchers studied surface acoustic waves in the sun's atmosphere, some of which penetrate to the sun's core, where they interact with gravity waves that have a sloshing motion similar to how water would move in a half-filled tanker truck driving on a curvy mountain road. From those observations, they detected the sloshing motions of the solar core. 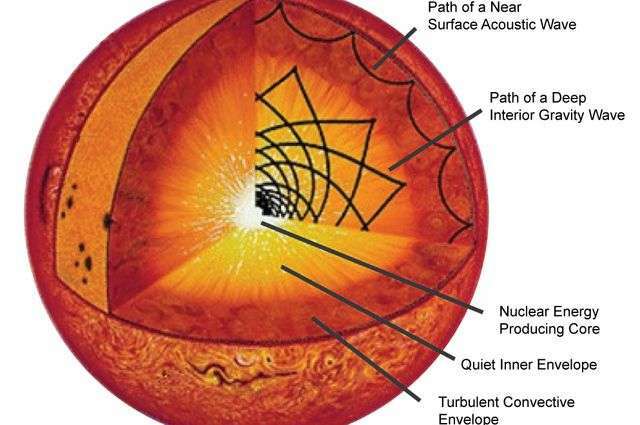 By carefully measuring the acoustic waves, the researchers precisely determined the time it takes an acoustic wave to travel from the surface to the center of the sun and back again. That travel time turns out to be influenced a slight amount by the sloshing motion of the gravity waves, Ulrich said. The researchers identified the sloshing motion and made the calculations using 16 years of observations from an instrument called GOLF (Global Oscillations at Low Frequency) on a spacecraft called SoHO (the Solar and Heliospheric Observatory)—a joint project of the European Space Agency and NASA. The method was developed by the researchers, led by astronomer Eric Fossat of the Observatoire de la Côte d'Azur in Nice, France. Patrick Boumier with France's Institut d'Astrophysique Spatiale is GOLF's principal investigator and a co-author of the study. The idea that the solar core could be rotating more rapidly than the surface has been considered for more than 20 years, but has never before been measured. The core of the sun differs from its surface in another way as well. The core has a temperature of approximately 29 million degrees Fahrenheit, which is 15.7 million Kelvin. 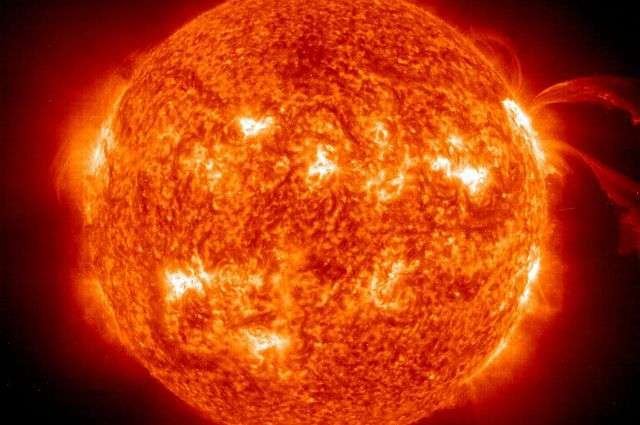 The sun's surface is "only" about 10,000 degrees Fahrenheit, or 5,800 Kelvin. Ulrich worked with the GOLF science team, analyzing and interpreting the data for 15 years. Ulrich received funding from NASA for his research. The GOLF instrument was funded primarily by the European Space Agency. SoHO was launched on Dec. 2, 1995 to study the sun from its core to the outer corona and the solar wind; the spacecraft continues to operate. "The core has a temperature of approximately 29 million degrees Fahrenheit, which is 15.7 million Kelvin. 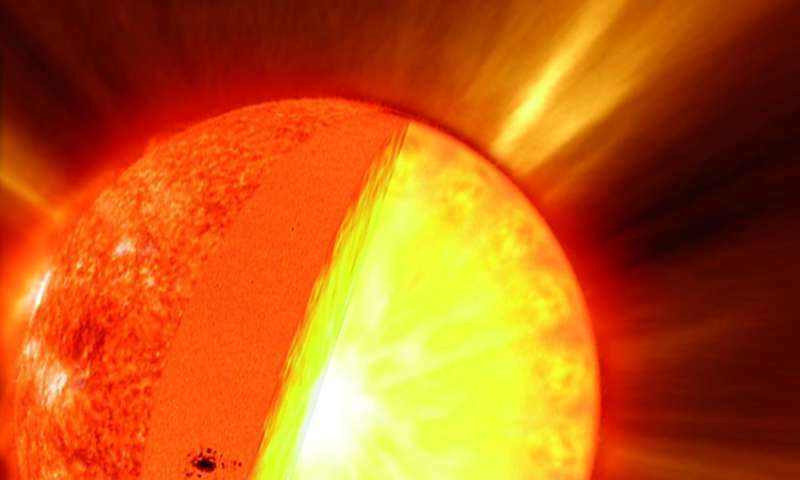 The sun's surface is "only" about 10,000 degrees Fahrenheit, or 5,800 Kelvin." And the Sun's corona above the 'cool' surface is 2 million kelvin. Go figure. The scientist must know that stars generate solar wind and that the minor value of solar wind opposite the friction material within the Sun. Sunspots are proof that within the star there is dislocation of matter between the layers. Observing nuclear fusion without the existence of radioactive radiation is not a science. There is a lot of fusion at the Sun, it's just TWO THIRDS LESS (emitted neutrinos) than to be expected with that size H-He conversion. No, the number of emitted neutrinos matches expectations, it's the number of electron neutrinos that was lower than expected before neutrino oscillations were established and experimentally confirmed. Quote from article: "The most likely explanation is that this core rotation is left over from the period when the sun formed, some 4.6 billion years ago,"
How would this explain the difference? Could a much more possibly dense core explain the difference? If so how would we explain the solid core? Oliver, where are you? Well, the Sun's core is far denser than its outer layers. The core is compressed to enormous pressures. Wild conjecture stated as a fact due to belief in unfounded maths. ...which isn't the point. His point is merely to make it look like he's worth something to anyone. And on the internet he can just go the full hog and make believe that he's worth something to *everyone* by claiming to be super-genius. Yeah...that it ain't working hasn't really sunk in. But then again - if someone is stupid enough to think this kind of scam would work, they're never gonna get wise that all they're doing is shouting "I'm an idiot" at the top of their lungs to the world. To be honest, you cannot expect or publish at the conference some critique of scientific community - such a thing wouldn't even pass the internal filter of editors, not to say peer-review. Well unless you have a theory/idea that you can prove with rigorous math, backed up by real data that does not conflict with other thoroughly and exhaustively well tested theories. The reason usually is, the commenters are stupid so they don't even realize, that their remarks have no relation to subject - or they're using it intentionally as an evasion for pushing their own agenda (also irrelevant to subject in a given moment). were you attempting to go for irony or just describing your own tactics for confirmation? pseudoscience falsified aether =/= science! This is all BS which has nothing to do with article subject and which I've no reason to comment right here. so you got caught lying and OT ranting about scientist, and now you want to point the finger at others for outing you? if it's not relevant then why did you comment about it right here? Total bull. I've seen it happen at the last conference I was at. In a session on brain connectivity studies the last talk was from someone who critiqued the use of brain atlases as the various atlases can lead to studies that show significance whereas the use of a different atlas might have lead a study to not be able to show significance. Guess what: That talk got the most applause. You're just a loser who lives in a fantasy you're concocting inside your tiny brain. The real world works nothing like you imagine. Nothing. If you actually have something to publish the do so. Don't hide in fear from your own failure. People out there are doing good work. You're just a loser-troll. Guess who is worth something? You certainly aren't. Your life is/was a waste. important point- please, for all laymen out there: why should anyone accept "your (or any) argument or suppositions with no evidence etc" over the "still working and adapting to new data current MS theory" that is backed by validated evidence? This is a news site with comments/discussion section open to all interested in commenting/discussing fairly, with the understanding that the logical/scientific validity or otherwise of any OPINIONS and/or CLAIMS in posts made here are the responsibility of the READER to check out further FOR THEMSELVES via further research/cogitation having regard to ALL available facts and possibilities of revision and correction which THE SCIENTIFIC METHOD dictates MUST be done/applied on a case-by-case basis and as the evolving observational/re-examinational situation demands of ANYONE purporting to be 'doing science discourse', whatever the venue or milieu, here on PO or elsewhere....and WITHOUT FEAR, FAVOR, RANCOR or BIAS of ANY KIND. NOTE: If one is merely looking to get the current textbook orthodoxy, they should consult same in forums catering for same; as distinct from forums such as these which discuss new/developing science/issues. Cheers. I assumed that everyone was aware of the variation of solar internal rotation rates as the dynamo generating the sunspot cycle -- similar to the Earth's magnetic field reversal cycle.